The Olympic Men's Marathon started and finished in the Sambódromo on Sunday, August 21. The lead pack jogged comfortably through almost the first 15 kilometers, when Eliud Kipchoge injected a little speed into the race. By that point the pack was 62 men, that went from a line across the street shoulder to shoulder to a string chasing the leader. At the half way point 46 still were hanging onto the lead group. Nine more dropped off by 25k. Over the next 5k, the pace gradually increased, losing the defending champion Stephen Kiprotich, and reigning world champion Ghirmay Ghebreslassie. At 30k there were only 8 still running together at the front. Lemi Berhanu seemed to be leading the increase of speed, calling back for his teammate Feyisa Lilesa to keep up. Within 2 kilometers, the lead pack was down to four. In the next kilometer, Berhanu fell off the back. By 33k, the medalists were decided. At 35k, Rupp was just behind Lilesa and Kipchoge. Rupp lost contact at the following water station. Shortly after losing Rupp, Lilesa was immediately behind Kipchoge and apparently clipped his heels. 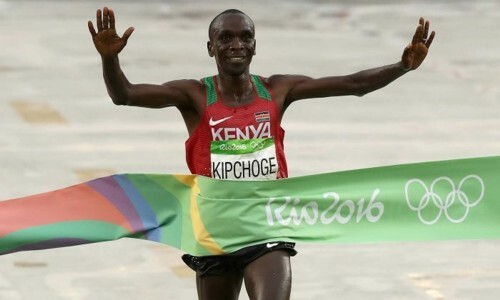 Kipchoge was angry, motioning to Lilesa to run next to him, to use the rest of the street. Lilesa didn't respond, Kipchoge accelerated away. From that point, as the course snaked around buildings, the three leaders lost sight of each other as the gaps between them increased. Slightly less than a minute behind the leaders, Ghebreslassie was speeding past the other stragglers. At 40k, Kipchoge had 36 seconds over Lilesa, Rupp another 12 seconds back and Ghebreslassie 59 seconds behind Rupp. Over the lengthy straight finish, Kipchoge expanded his lead to 1:10, giving the thumbs up to the crowd as he finished at 2:08:44. Lilesa struggled before crossing the finish line at 2:09:54. Rupp finished at 2:10:05 still 59 seconds up on Ghebreslassie. The sky remained overcast throughout the race. The streets remained wet. The Olympic Women's Marathon started and finished in the Sambódromo on August 14, 2016. At 9:30 in the morning, the race started with temperatures around 19 °C (66 °F). The pack stayed bunched, with Mare Dibaba, Visiline Jepkesho, Rose Chelimo, Volha Mazuronak and Tirfi Tsegaye each taking their turns in the spotlight. The racing got serious, the pack was down to seven at 30 kilometres with American Desiree Linden the closest pursuer but unable to get back with the group. Shalane Flanagan was consistently toward the back of the group, then she began to fall off. As Flanagan and Mazuronak struggled with the group, the remaining five African runners surged, the gap grew. Chelimo was the next to drop off the group. Eunice Kirwa never held the lead and Jemima Sumgong only asserted herself in the last 5 kilometers. 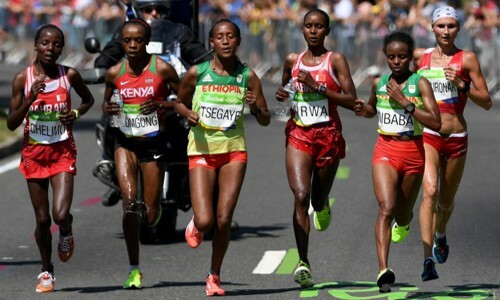 When she did, the pack strung out to a straight line, former race walker Mazuronak and Tsegaye falling off the back. At a water station, Dibaba was the last to fall off, and then there were two. World Championship bronze medalist and Nagoya Champion Kirwa shadowing London Champion Sumgong until the final kilometer. Then Sumgong expanded the gap in the long final straight into the finish. By the finish of the race, the temperature had risen to 26 °C (79 °F).